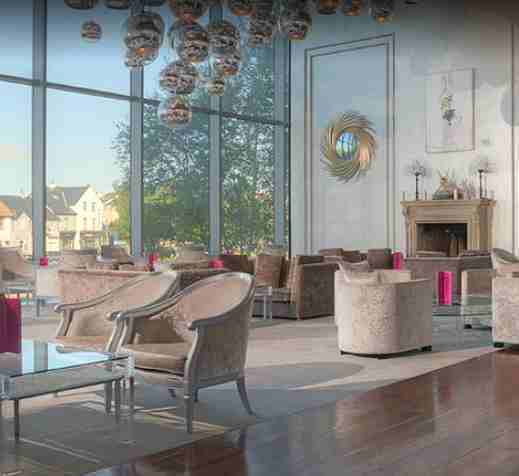 Designed by the world renowned milliner, Philip Treacy, the g has three stunning Signature Lounges each unique in it's own personality ensuring our guests can relax in comfort and in style. 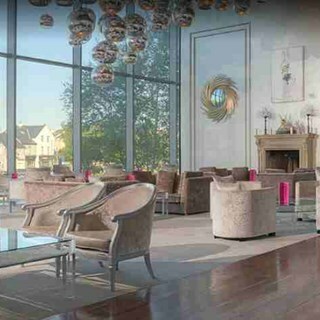 From the calming Grand Salon adorned by 300 twinkling mirror balls which reflect the waters of Lough Atalia, to the distinctly ‘pink’ Ladies Lounge and the plush Blue Gentleman’s Lounge. The Signature Lounges are perfect for casual dining with food served from 11am – 10pm and a wide choice from g Bites to main-courses and tempting treats on the menu. Our Lounge menu is served all day with soup and sandwiches and hot dishes served between 11.00am-5.30pm and our evening menu is served from 5.30pm - 10.30pm. Booking was made for wrong day. I am allergic to Garlic so when I ordered the chicken diner I made this clear and asked for the plain potatoes instead. I was given garlic mash. Had to send it back. Took 10 minutes . My wife had eaten hers in that time. Wrong dessert was then brought out. Also sent back. Due to the mix up I was not charged for the pint of Carlsberg. But it was just about drinkable anyway! The attention to detail is superb. The lady who looked after us took time to explain choice of teas and food in detail. Great items for non meat eaters I e hummus and lentil. All staff extremely helpful and friendly. Nice touch with additional dessert sporting a candle for birthday lady. I have had many afternoon teas in Singapore and Ashford Castle but this one was my favourite. Brilliant day for our sons 1st Holy communion meal we had 25 guest and the feed back was very good form everyone the food and service was excellent and all round it was a fantastic day, we also had the pink room after the meal for a drinks reception and cake with table service that was also an excellent service. Well done thank you for a super and memorable day. Very disappointing experience for the 2nd time this year. Will not be going back anytime soon. Really enjoyed it. Only comment was that the travel was close to two others, but as is life. I wouldn't out it down for that. Billy was great with the service. We went for afternoon tea to celebrate my daughters 30th birthday, and we were very disappointed. The first plate with the scones and sandwiches was nice, but the desserts were very  very disappointing. The only OK think on the dessert plate was the little raspberry and chocolate cake, and even that wasn't great. Everything else, including the dessert in the glass with the disgusting jelly on top were terrible, very very disappointing. Considering what it cost us for 4 pink afternoon teas (the prossecco was nice) it was very bad value for money, and we won't be returning. Would not go back here again for Afternoon Tea as the overall experience was very disappointing. After a considerable wait we were finally presented with one stand containing sandwiches and scones for ONE not TWO. There had been a mix up despite presenting the host with the voucher on arrival and booking it for two people. We were not told that there had been a mix up and that the second stand was coming until we asked the server again for an update. After 40 minutes we were finally presented with afternoon tea for two - sandwiches were nice but nothing amazing however the scones were lovely. After another wait we were then presented with a the desert plate which the waiter promised to include more of as a gensture for getting the order wrong initially, but the amount was as it should be and there was no extra presented. For a 5 star hotel we expected a lot more and what was meant to be a lovely treat for my mum ahead of her birthday and Mother’s Day but it left a lot to be desired. Service was lacking and seemed understaffed for a busy Saturday afternoon. For the sake of others booking I would hope you take this feedback on board and not leave others as disappointed as we. Its lovely but the restaurant is better than the lounge for not much more money. We have been given the dinner and movie voucher for 5 Christmases and the lounge menu has barely changed. The food is nice and service is great. It's okay value for money. Drinks are expensive. The staff were wonderful. Setting super. Lovely touch’s with balloons for the birthday ‘boy’.Afternoon tea in the G is a real experience but very overpriced compared to other hotels. Gorgeous afternoon spent with family in a relaxed, luxurious environment with delicious food and friendly service. Lunch was great as we're serving staff , a little disappointed with spa as , when we began our experience there was flow to what was happening , girls at spa desk firstly tried to give us mis matching flip flops so it was trial and error to find a pair that fit , also they were not kept in any sort of order , facial and back massage were ok , nothing special although my therapist was very nice , friends I was with felt the same about treatments . Really enjoyed afternoon tea in beautiful surroundings.